There’s nothing quite like a Zip Hydrotap. Only a zip hydrotap residential system can completely transform your ordinary water into delicious, clear drinking water. This smart and essential addition to your kitchen provides chilled, sparkling and boiling water immediately. Using a zip hot water tap, you can instantly prepare coffee, tea, and other warm beverages, without tying up precious countertop space with a kettle. This is not only convenient but will encourage you and your family to drink more water. Increasing water intake can have some great health benefits, but it is even easier when you have access to delicious drinking water. Zip Hydrotap BCS is one of the most advanced drink appliances in the world. This Australian made integrated innovation combines fantastic technology to ensure that you have access to the water you need when you need it. The Zip Hydrotap combines the patented Direct DryChilling, ColdCore Carbonation and PowerPulse boiling innovations with MicroPurity filter technology to ensure that regardless of whether you want chilled, hot or sparkling water, it will have a taste you’ll love instantly. The Zip Hydrotap is available in a myriad of styles and colours to complement your decor and personal preferences. Whether you are looking to install this advanced drinking appliance in your home or workplace, you can have it your way with a premium finish that eliminates the need for a kettle on your benchtop and water bottles cluttering up your fridge. You can transform your kitchen into a sleek, stylish and safe environment. This under sink drinking water system offers amazing convenience, providing filtered chilled still or sparkling water and boiling hot water with the simple touch of a button. The integrated filter can transform ordinary tap water into extraordinary drinking water. 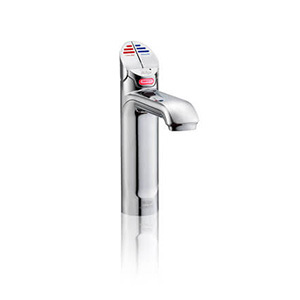 The electronic dispensing tap features a safety lock to protect against scalding and function indicators for ease of use. The touch display provides menu navigation to set your desired temperature and activate the energy saver mode. The lever locking position allows you to fill your glass, mug or pitcher without a need for holding. The Zip Hydrotap also features easy to replace filter cartridges that contain activated carbon and provide sub micron particle filtration to improve the taste of your drinking water, transforming your humble tap water into delicious, crystal clear water. If you would like to find out more about the benefits of Zip Hydrotap residential systems, you should speak to us. The Aussie Natural Filtration team would be delighted to answer any queries you may have about Zip Hydrotap BCS systems to help you to choose the option best suited to your unique requirements.